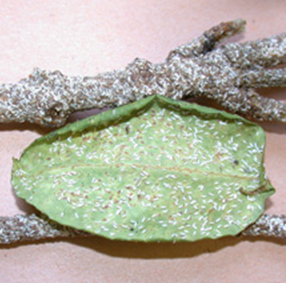 High populations of Euonymus scale can cause leaf loss and twig death. Euonymus scale is a non-native scale that attacks evergreen shrub and vine forms of Euonymus (e.g., wintercreeper). In addition, this insect attacks privet, bittersweet and pachysandra. Appearance: Euonymus scale females grow up to 1/16 inch in length, are brown and are shaped like tiny oyster shells. Euonymus scale males are smaller than females, white and elongated. 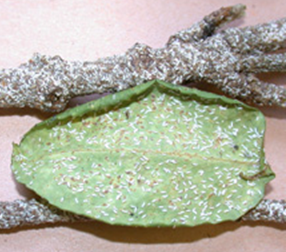 Symptoms and Effects: Euonymus scales feed on plant sap. Feeding damage first appears as yellow spots on leaves. When infestations are heavy, scales encrust leaves and branches, with feeding damage causing defoliation and branch dieback. Life Cycle: Euonymus scale has two generations per year in Wisconsin. Eggs are protected under female scales and hatch in early June. The immature stages of the insect are called nymphs and an early mobile nymph stage is called the crawler stage. Nymphs are active over a period of a few weeks, and develop into adults after four to five weeks. A second generation of scales is produced in late July and August. This second generation matures, and the adults overwinter. Control: Euonymus scale can be difficult to control. Heavily infested branches should be removed. Spray insecticides containing carbaryl, cyfluthrin, horticultural oil, insecticidal soap, malathion, or permethrin can be used for control of the crawler stage of Euonymus scale. Adults are protected from these insecticides by their scale coverings, and only young crawlers can be killed with spray treatments. Therefore, spray treatments should be started in early June, and three applications made at 10 to 12 day intervals are needed to achieve control. Thorough coverage of both the upper and lower leaf surfaces is required for spray insecticides to be effective. Systemic insecticides such as imidacloprid can also be used for control. However, while these products reduce scale populations, they typically do not provide 100% control of Euonymus scale on woody plants. Imidacloprid-containing insecticides are used as soil drenches and should be applied in the fall. Finally, two parasitic wasps and two predatory beetles have been introduced into the US to help control Euonymus scale. The lady beetle Cybocephalus nipponicus can be purchased by homeowners and released to aid in control.